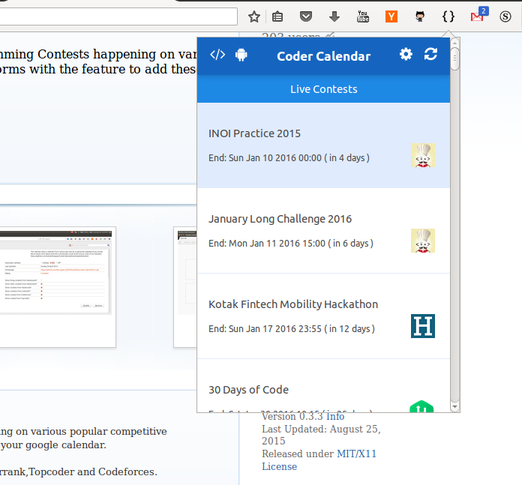 We all know how difficult it is to be aware of the different coding competitions taking place on various websites,so I’ve made an add-on(extension) both in chrome and firefox to make this task easy. Add to google calendar feature. Star the project in Github to show your support. Found any bugs? Have any suggestions to make this project better? Know any other cool coding sites? Would you please add Option to select time zones, and change the default timezone to the one OS set to, instead of Indian timezone ? Some good extension here in the thread, Thanks for sharing. Great job.Needed one like this. If we click it two times, it should close. I will suggest if you can do this it will be better. can you make it possible that we can view brief info about the event in the android app? so that we can now what type of contest or hackathon it is thanks! like hover and show the name of the website? @nishant_v Yes. That’s exactly what I’m talking about. OK.I’ll add it in the next update (y).